I actually took these photos late in the fall, on one of the last, nice spring days. It seemed silly to post warm-weather wear after the temperatures dropped, so I’ve been sitting on these pictures. The weather is nice enough for bare legs again (depending on the day), and this is an outfit that I’ll wear in spring too. I’ll have to paint my nails blue again too! I found this top at a sample sale and loved the color, softness of the fabric, and the way the neckline draped. The skirt was from a clothing exchange. I was drawn to the vertical panels. Sometimes I like putting together a unique look; other times simple style does the trick. Do you have a go-to look for spring? I’ve joined Visible Monday at Not Dead Yet. Have a look at what all the others are wearing. I love the whole look and particularly love those sandals! For me, a go-to look in unpredictable San Francisco spring weather = rocking a sundress with knee-high boots. Adds some funk to the frill and keeps me warm when the weather turns. So long as I remember a sweater, this look works for both the warm days and chilly afternoons/evenings. Thanks for posting and keep them coming, you fashionista you! Thanks for commenting! I love a sundress and boots. It’s a great spring transition look and makes a delicate dress more badass! I bet pea green slouchy boots would look good with a sundress too (wink wink). I hear you about the sweater. Like SF, Seattle usually has cool evenings. Such a great warm weather look. Blue is def my go-to color, too. Thanks for linking up! Thanks Patti! I am drawn to blue. It’s a great neutral. Denim will always be in style, and oddly enough, it is neutral, goes with everything. 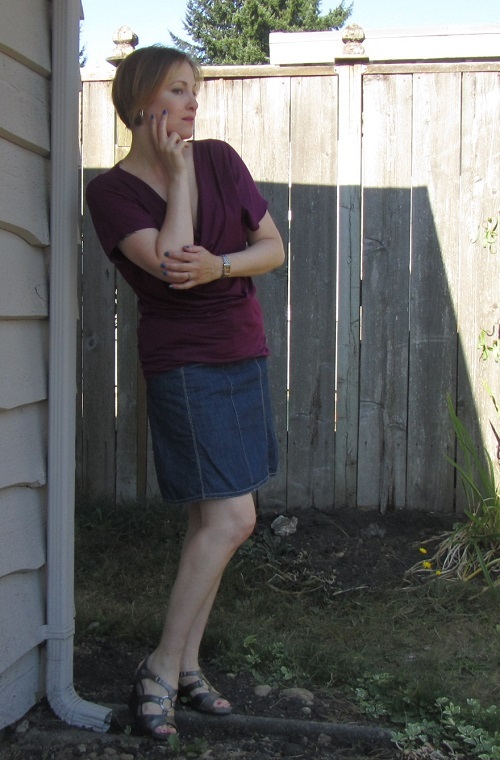 Love the colour of your top and it dresses up the denim skirt. You look great!! Thanks! It’s simple, but it’s nice to have clothes you know will work without a lot of fuss. Love the drapes of your shirt….very feminine. The colors really pretty on you. My go to look for spring? BF jeans & blouse/t-shirt. Jeans and a blouse/t-shirt is classic and can be dressed up or down. Good choice!